US Colorado: Roberts Rinehart, 1998. 1st Edition 1st Printing. Hardcover. Fine/Fine. 8vo - over 7¾ - 9¾" tall. A First US edition/First printing with full number line 10 9 8 7 6 5 4 3 2 1 on the copyright page. Both book and D/W are complete and in brilliant order. his is an extremely rare book and no UK copy was published. Here is a brief synopsis of the content : 'Sean McPhilemy has written a potentially explosive book, issued at a time when the recently signed Northern Ireland peace settlement offers a last best hope for expanded political cooperation and an end to sectarian violence. It¿s a fragile settlement, freighted with hope, but fraught with expressed misgivings by at least some of the signers from North and South. McPhilemy¿s revelations about The Committee (¿the most important Loyalist terror grouping¿) may be continued in pending libel suits and could well prove highly embarrassing.The Committee was born of assassination and fear and became an efficient purveyor of both. Its origins confirm how easily the best political initiatives backfire. Appalled by IRA killings of Protestants in Ulster and by a death-for-a-death response by various Ulster armed factions against Catholics in the six counties, Margaret Thatcher signed the November 1985Anglo-Irish Agreement, giving Dublin some voice in the governance of Ulster. Her attempt to strengthen the position of Catholics in Ulster enraged the diehard elements of the Protestant population. Ulster Resistance, the Movement for Self-Determination, the Ulster Loyalists, and Ulster Clubs sprang up, allying themselves to the long-established Royal Ulster Constabulary (with its hard-core ¿Inner Force¿) and the hard-line Ulster Defense Regiment. McPhilemy provides a powerful account of how the Ulster loyalists? determination to undermine the agreement, eradicate the terrorist Provisional IRA, and return to the status ante quo coalesced into the formation of The Committee. Its most sinister role was to direct the liaison between the UDR, the RUC, and other official bodies, providing information to armed illegals. Targeted killings followed.In 1991, McPhilemy began investigating a series of Committee-sponsored killings of IRA members, other Republicans and innocent Catholics in Ulster. Genuine inside sources provided vital information; a bogus inside source attempted to foist false information on McPhilemy. His most disturbing finding was that these were not predictable responses by Ulster Loyalists to Provisional IRA killings, but were planned assassinations, with official connivance, aborted inquiries and cover-ups. The assault on IRA terrorism had become as lawless as the terrorism it opposed; government, including those responsible for enforcing the law, had become lawless. In October 1991, BBC TV ran McPhilemy¿s documentary, The Committee, which he completed in the face of difficulty and obstruction, but meeting the rigorous criteria set by BBC management. The broadcast opened floodgates. Predictably, denouncements and denials(¿the program is a hoax¿) flowed from every level of British and Ulster government; pro-government newspapers joined in condemning McPhilemy, the BBC and the program. In typical institutional fashion, the RUC saw fit to ¿investigate¿ itself. This and other investigations claimed to be stymied by McPhilemy¿s refusal to name a confidential source whose life would been dangered by identification. No brief review can capture the full thrust and scope of Sean McPhilemy¿s book. He takes the reader beyond the stark horror of the kill-and-be-killed syndrome, exploring through statement and transcript the controlling webs of complicity and of loyalty (however misplaced). He illuminates the corrosive corruption into which any govern-mental body sinks when it allies itself to illegal acts, whatever the lawful aim or public good it believes it is pursuing. In addition, he strikingly portrays the pressures and costs of pursuing one¿s convictions, including court battles against his detractors battles in which he has won some victories.' WOW! Boulder, Colorado, U.S.A.: Roberts Rinehart Pub, 1998 hardback book and dust jacket in near fine condition. Hardcover. Near Fine/Near Fine. Niwot: Roberts Rinehart Publishers, 1998. First printing. Hardcover. Near Fine/near fine. Signed first edition, 1998. Cloth hardcover with dust jacket, 418 pp., clean unmarked text, Near Fine copy in Near Fine dust jacket. Dust jacket housed in archival dust jacket protector. Signed and inscribed on the titlepage. Niwot, Colo: Roberts Rinehart Publishers, 1998. 1st ed. hardcover. Near fine in a near fine to very good++ jacket. In archival mylar./near fine. Quarto black cloth, black d.j. with silver spine, in archival mylar wrap; 418 pages,  pages of plates : illustrations ; 24 cm. "In 1991 Sean McPhilemy produced "The Committee", a sensational documentary for British television that revealed that a group in Northern Ireland- drawn from the Unionist members of the business community, Protestant clergy, the police (RUC), and the British security forces- was systematically colluding with Loyalist terrorists to murder Irish Republicans and other Irish Nationalists. The documentary contained exclusive firsthand testimony of a member of the Loyalist committee responsible for the murders. This source provided a detailed account of how various assassinations had been planned and carried out. The broadcast of "The Committee" resulted in highly publicized legal proceedings in the High Court in London when the British Conservative government tried unsuccessfully to force the program makers to identify their source. Since the broadcast of his documentary, McPhilemy has struggled to protect his reputation in the face of various legal actions against him over the program. Harassed by British authorities and his life threatened, he has brought two libel actions against newspapers in London that sought to discredit him. This book gives a full account of the murder conspiracy, the making of the documentary, the subsequent legal proceedings, and additional evidence that substantiates the original allegations." -- Publisher description. Explains how Sean McPhilemy's documentary about a how a group of Unionists are killing Irish Nationalists has created controversy over whether or not he should reveal his sources. || Political violence -- Northern Ireland -- History -- 20th century. Condition: Near fine in a near fine to very good++ jacket. In archival mylar. Niwot: Roberts Rinehart Publishers, 1998. US reprint, large 8vo, 418pp, photo illustrations; VG+ Copy in VG+ DJ. Reprint. Hard Cover. Very Good/Very Good. 8vo - over 7¾" - 9¾" tall. Roberts Rinehart Publishers, 1998. Very Good. 418 pages,  pages of plates : illustrations ; 24 cm. Hardcover and dust jacket. Good binding and cover. Minor reading wear. Explains how Sean McPhilemy's documentary about a how a group of Unionists are killing Irish Nationalists has created controversy over whether or not he should reveal his sources. Roberts Rinehart Pub. Hardcover. 1570982112 This is a hardcover book with dust jacket. !!! !This is a 1st Edition!!!!! . New. Denver, Colorado, U.S.A.: Denver Museum of, 1999. trade paperback in near fine condition. Soft cover. Fine. Boulder, Colorado, U.S.A.: Roberts Rinehart Pub, 1998. Hardback in very good condition with very good condition dust jacket.. Hardcover. Very Good/Very Good. Niwot, CO: Roberts Rinehart Publishers, 1998. 418 pp., black cloth w/ gold lettering; Dust jacket in clear archival cover; Book shows light bumping to ends of spine & corners of boards; Jacket shows slight wear to ends of spine & folds w/ a couple of small scratches & light to moderate rubbing overall / ". . . encapsulates veteran journalist Sean McPhilemy's eight-year investigation into a high-level terrorist conspiracy in Northern Ireland. The evidence indicates that, since 1989, senior officers of the RUC (Royal Ulster Constabulary) helped a then unknown terrorist organization, the "Committee", assassinate Republicans, Nationalists, and innocent Catholics in an effort to block any moves towards a united Ireland". 3rd Printing. Hard Cover. Very Good -/Very Good -. 8vo - over 7¾" - 9¾" tall. Niwot, CO: Roberts Rinehart Publishers, 1998. 418 pp., black cloth w/ gold lettering; Dust jacket in clear archival cover; Book shows light bumping to ends of spine & bottom corners of boards; Jacket shows slight wear to ends of spine & folds w/ a couple of scratches to rear panel & light to moderate rubbing overall / ". . . encapsulates veteran journalist Sean McPhilemy's eight-year investigation into a high-level terrorist conspiracy in Northern Ireland. The evidence indicates that, since 1989, senior officers of the RUC (Royal Ulster Constabulary) helped a then unknown terrorist organization, the "Committee", assassinate Republicans, Nationalists, and innocent Catholics in an effort to block any moves towards a united Ireland". 3rd Printing. Hard Cover. Very Good/Very Good -. 8vo - over 7¾" - 9¾" tall. Committee: Political Assassination in Northern Ireland. [Hardcover] by..
Denver, Colorado, U.S.A.: Denver Museum of, 1999. trade paperback in very good + condition. new updated edition.. 2nd Edition.. Soft cover. Very Good. Boulder, Colorado, U.S.A.: Roberts Rinehart Publishers, 1998. 418pp including index "The Committee gives a full account of the murder conspiracy, the making of the documentary, the subsequent legal proceedings and even more importantly, additional evidence that substantiates the original allegations.". First Edition. Cloth Hardback. As New/Fine+. Boulder, Colorado : Roberts Rinehart Publishers, 1999. 6" wide by 9" tall. Bright, clean, tight, square, unmarked copy. No creases. Appears unread. Light cover wear. Not price clipped (16.95). No store stamp, owner's name or bookplate. No remainder mark. Controversial book. Added to this expanded second edition is a "Postscript to the Paperback Edition" which discusses the legal battles waged against the author and his publishers over this book. He also updates his inquiry into the "collusion between RUC Special Branch and Loyalist terrorists in the murder of Republicans and politically uninvolved Catholics." Index. . 1st printing of "New Updated Edition." . Trade Paperback. Very Good+ condition. xiii, 434pp + 12 pages of photos. Edition: 1st printing of "New Updated Edition." 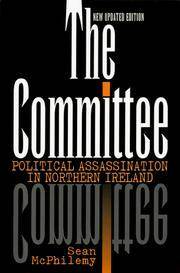 The Committee: Political Assassination in Northern Ireland. New Updated 2nd Ed. Denver, Colorado, U.S.A.: Denver Museum of, 1999. Trade paperback in fine condition. New Updated 2nd Edition.. 2nd Edition.. Soft cover. Fine. ROBERTS RINEHART PUB, 1999. Hardcover. Very Good/Used; Very Good . 418 PP BLACK BOARDS WITH GILT LETTERING TO SPINE. CLIPPED PRICE JACKET, ALMOST NEW CONDITION. BLACK AND WHITE PHOTOS. TIGHT AND BRIGHT. Niwot, CO: Roberts Rinehart, 1998. First American edition. Hardcover. Fine/fine. First American edition. Fine in bright, crisp dust jacket. Hardcover. 418 pp. with index. Reportedly banned in the U.K., the book that resulted from the sensational British documentary that revealed that a group in Northern Ireland---drawn from Unionist members opf the business community, Protestant clergy, the police (RUC), and British security forces---was systematically colluding with Loyalist terrorosts to murder Irish Republicans and other Irish nationalists. Niwot, CO: Roberts Rinehart. Fine copy in nearly fine dust jacket. 1998. 1st. hardcover. 8vo, 418 pp. .
NY: Roberts Rinehart Publishers, 1998. First Edition, First Printing; dj w/unclipped price; 478 clean, unmarked pages/index. 1st. Hardcover. Near Fine/Near Fine. Illus. by B/w. 8 vo. Niwot. 1998. Roberts Rinehart. 1st Printing. Very Good In Dustjacket. ISBN:1570982112. 418 pages. hardcover. FROM THE PUBLISHER - In 1991, Sean McPhilemy produced The Committee, a documentary for British television that revealed that a group in Northern Ireland - drawn from the Unionist members of the business community, Protestant clergy, the police (RUC), and the British security forces - was systematically colluding with Loyalist terrorists to murder Irish Republicans and other Irish Nationalists. The documentary contained exclusive firsthand testimony of a member of the Loyalist committee responsible for the murders. This source provided a detailed account of how various assassinations had been planned and carried out. The Committee gives a full account of the murder conspiracy, the making of the documentary, the subsequent legal proceedings and, even more importantly, additional evidence that substantiates the original allegations. inventory #25726 ISBN: 1570982112. Niwot, CO: Roberts Rinehart, 1998. Very clean, tight and bright.. Hardcover. Near Fine/Near Fine. Niwot, CO: Roberts Rinehart, 1998 ISBN 1-57098-211-2 Octavo (9.25 in. by 6.25 in. ); 418pp. ; very good hardcover; very good dust jacket; age-toned, rubbed, bumped dust jacket edges; bumped book corners; crisp; clean; bright..
CO: Roberts Rinehart, 1998. Bound in gray cloth, stamped in gold, in matching dust jacket. A tight, clean copy of this 418 pp. book on Political Assassination in Northern Ireland. . Fourth Printing. Hard Cover. Near Fine/Near Fine. Niwot, CO: Roberts Rinehart Publishers, 1998. First printing. Hardcover. Very Good-/very good-. 8vo. , 418 pp. Bound in full black cloth in black dust wrapper printed in white gray and yellow. Black and white photographs. Very Good+ some soiling and foxing to all edges of text block, spine slightly cocked, internally clean, light rubbing and wear to extremities of binding, in Very Good+ dust wrapper with minor wear to extremities, light scuffing overall. Boulder, Colorado, U.S.A.: Roberts Rinehart Pub, 1998. Very clean and sound.. Hard Cover. Near Fine/Near Fine. Roberts Rinehart, 1998. Book. Good. Hardcover. First Ed. First ed. Good/Good condition. Over all wear to book and dustjacket, there are scuff marks on the inside front cover and FEP and a gift inscription written in a child's hand (rather strange, considering the subject matter) on the FEP. The dusjacket has numerous scratches on both the front and back covers..
Roberts Rinehart Publishers. Used - Very Good. Great condition for a used book! Minimal wear. Roberts Rinehart. Used - Good. Shows some signs of wear, and may have some markings on the inside. Niwot, CO: Roberts Rinehart Pub., 1998. (1998), 418pp, illus., slight rubbing & edgewear to dj, contents clean.. First Edition. Cloth. Very Good/Very Good -. Niwot CO: Roberts Rinehart Pub, 1998 DJ has thin vertical crease on front flap. 418pp with Index. Black cloth. 1st Ed. with complete number line. Square, tight, bright copy with firm corners. No remainder mark. No internal notations, names or markings. Photo illus. in b&w. Crisp, unclipped DJ in Mylar cover ($24.95). Lambastes the Unionist for running "DeathSquads" against the Northern Irish Nationalists. USPS Tracking provided. H. First Edition. Cloth. Fine/Almost Fine. Illus. by Photo Illus. In b&w. 8vo - over 7¾" - 9¾" tall. Niwot, CO: Roberts Rinehart Publishers, 1998. 4th Printing. Octavo; vg/vg; dj, glossy orange, fading down to black, spine with white text; dj, light shelf wear; HB, black cloth spine with gold text; boards, minor shelf wear and bumping; text block, clean; 418pp. Shelved Rockville Bookstore. Roberts Rinehart Publishers, 1999. Paperback. As New. Disclaimer:An apparently unread copy in perfect condition. Dust cover is intact; pages are clean and are not marred by notes or folds of any kind. At ThriftBooks, our motto is: Read More, Spend Less.Dust jacket quality is not guaranteed. Roberts Rinehart Publishers, 1999. Paperback. Good. Disclaimer:A copy that has been read, but remains in clean condition. All pages are intact, and the cover is intact. The spine may show signs of wear. Pages can include limited notes and highlighting, and the copy can include previous owner inscriptions. At ThriftBooks, our motto is: Read More, Spend Less.Dust jacket quality is not guaranteed. Roberts Rinehart Publishers, 1998. Hardcover. Very Good. Disclaimer:A copy that has been read, but remains in excellent condition. Pages are intact and are not marred by notes or highlighting, but may contain a neat previous owner name. The spine remains undamaged. An ex-library book and may have standard library stamps and/or stickers. At ThriftBooks, our motto is: Read More, Spend Less.Dust jacket quality is not guaranteed. Roberts Rinehart Publishers. Paperback. GOOD. Spine creases, wear to binding and pages from reading. May contain limited notes, underlining or highlighting that does affect the text. Possible ex library copy, thatâll have the markings and stickers associated from the library. Accessories such as CD, codes, toys, may not be included.